I have to tell you......I think this is the easiest thing I have ever made. and then make more because your family ate it really fast. Perfect for topping your yogurt, or eaten alone--as an awesome snack or breakfast. It's lightly sweet, and keeps you full longer than ordinary cereal would. This is a good basic recipe that you can add what you like to--dried cherries, mangos, apricots--whatever floats your little granola boat. i love making granola - the smell filling the house is amazing. love your pictures! yum, i make this about once a week! i will have to try your recipe! i add a little dry milk to mine and it makes it chewy. reallllly good, also add a pinch of cinnamon and delish! My parents make granola every other week and eat it all the time. It's SO much better than store bought granola too. I'll have to try your recipe! this could not have come at a better time. you're not going to believe this: i was digging through your recipes just last night, certain that you'd have the perfect granola recipe. i was so surprised that you didn't...until today! i've been craving something healthy and crunchy and am off to make this asippitysap! I can't think of a more beautiful breakfast! I still have to try making my own and this recipe looks great. My mom made homemade granola the other day. It was delicious. Ooh, this looks amazing! 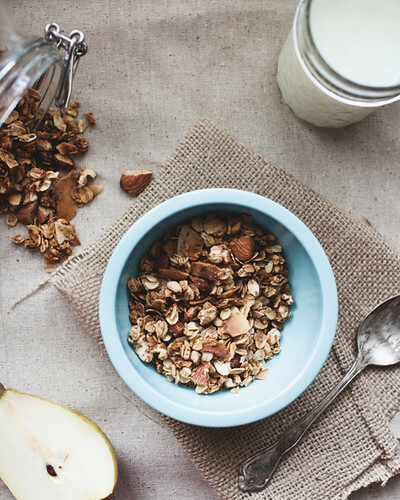 I love making homemade granola and adding whatever you want to it! I think I'll add dried apricots, almonds, chia seeds and white chocolate chips! ... and a few dark chocolate chips certainly can't hurt! 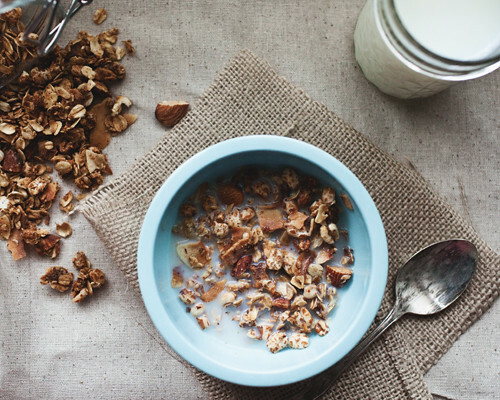 isn't homemade granola the best? you'll never go back to whatever it was you were having before. at least not permanently. i think we're on the same page, i've been using puffed grains in our granola for the past few weeks too, i love the texture and it's easier for the mini mouth in the family to chew. as always, you're inspiring + your images are stunning. p.s. you should try coconut oil sometime instead of olive oil, it's pretty much amaze-balls. no fat. low fat. stop fat. go fat.